Two hectic games on Sunday afternoon Sept 29 provided the crowd with entertainment and lots to talk about in the Hong Kong Hockey Association Premier Division. Following on from two fairly uneventful matches between Punjab-A and SSSC-B, and KCC-A against Elite-A, which ended in wins for Punjab (4-1) and KCC (5-1), the stadium burst into life for the SSSC-A against Valley-A game. Then Shaheen and Khalsa took the energy in the stadium to a higher level still when they played out a 5-all draw. Bullets (SSSC-A) shot out of the starting gate and were one goal to the good in just the first few minutes of the match. They looked like continuing in that vein with long accurate passes up field and good skills by the attackers, but gradually Valley got themselves organised. Valley adapted to the pace and started to nullify the SSSC-A play, scoring an equaliser before half time. The match was very frantic, arguing with the umpires was common and there was a lot of shouting from the crowd over penalty corner decisions. Valley drew away 4-2 in the second half, but SSSC-A pushing hard pulled another goal back just before the end to make the final result 4-3 to Valley. After the match Valley-A coach, Mark Kake gave his impression of the game to the Epoch Times. “We conceded that one at the end but by then I think the guys knew they were home with only a minute or 30 seconds to go,” said Kake. “Pretty brutal, clash of styles, structure against five up-five back, but it was always going to be physical,” he admitted. After Shaheen’s victory last week over SSSC-A all eyes were on Shaheen to see how they might fare against last year’s league champions Khalsa. Before the match a staunch Khalsa supporter Jagdev Singh assessed the game as 50-50, which was quite surprising as I estimated 60-40 or even 70-30 in favour of the champions. Khalsa played some superb hockey in the first half, but missed quite a few chances on the Shaheen goal. Top players for Khalsa got into good scoring positions, but the ball just slipped past the posts until Ahmed Ewis had a penalty corner chance, which he drag flicked into the top corner. The scoreline was 2-1 to Khalsa-A at half time and Khalsa added another soon after the start of the second half. But Shaheen had an inspired period of play getting three goals in 10 minutes to take the lead at 4-3, with Shaheen veteran Asghar Ali cutting through the Khalsa defence to secure two super scores. The supporters of both sides were on fire with the game in the balance. Khalsa brought the score back to 4-4 with a controversial goal, which held up play for some minutes, but by then Khalsa had lost their normal controlled shape and passes were going astray. Shaheen added another from a short corner with only a couple of minutes left on the clock, but a short corner to Khalsa gave Ahmed Ewis another shot pushing the final score to 5-5. Gurcharan Singh the Khalsa team manager was obviously disappointed to drop points. “We have to rectify the mistakes we made today and we will rectify them,” Singh told the Epoch Times. “The umpiring was not up to standard and they made the game so much of a panic,” he continued. He conceded that Shaheen are improving, but the umpiring was still on his mind. “Shaheen have got some good players coming up, but the umpires called the day today,’ he concluded. Arif Ali of Shaheen showed his obvious delight after the match. “… getting a draw against Khalsa is fantastic especially that we have such a young and very determined group,” Ali told the Epoch Times. “I think from the first game, when we beat Pakistan and last week when we beat SSSC-A, everyone’s confidence is really high up. 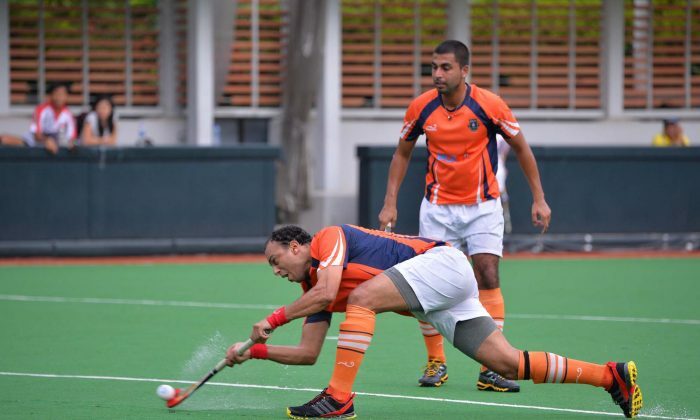 “It is not only good for us, but it is good for Hong Kong hockey. “There are so many players to choose from now for the Hong Kong team, so it is really great,” Ali explained. “The umpires did make a lot of mistakes, but what can we do? We just keep playing and staying focussed,” he added. In the two matches played at the Football Club: HKFC-B narrowly defeated KNS-A 4-3 and HKFC-A had an easy 8-1 win over Pak-A. Although KNS-A have yet to score a point, it looks like their level is fairly up to standard with a good chance of improving as the season progresses. Pak-A on the other hand seem to be struggling without their stalwart goal scoring machine Ishtiaq Ahmed, who moved to Khalsa for this season. After Week 3, the top six teams are HKFC-A and Punjab-A on nine points, Khalsa and Shaheen are both on seven points, with Valley and SSSC-B both on six points. HKFC-B won their match against the Dutch Club 3-0 after being 1-0 up at half time, but it was quite an equal game and the Dutch players held their own very well. They had some good chances in front of goal but HKFC-B’s new American College goalkeeper put on a good performance stopping the Dutch club from scoring. The men’s and women’s premier fixtures now take a break as many players are away at the East Asian Games. The ladies have three matches planned on Saturday Oct 19, but the men do not restart until Sunday Oct 27. Exceptions to this are: HKFC-B vs Recreio-A on Saturday Oct 5 and SSSC-B men play their club-mates SSSC-A on Oct 20. Preliminary rounds of the East Asian Games hockey tournament in Tianjin, China start on Oct 6. All of the Hong Kong squads are eager to participate and have high hopes of a medal. The Hong Kong women start against Japan on Sunday Oct 6, they then play Chinese Taipei on Tuesday Oct 8 and China on Thursday Oct 10. There are then finals for 1-2 and 3-4 places on Saturday Oct 12. China, Korea and Japan are currently 7, 8 and 9 respectively in the FIH world rankings. HK women’s are ranked 53rd. The Hong Kong men also start their round robin matches against Japan, but on Monday Oct 7, followed by China on Wednesday Oct 9 and Korea on Friday Oct 11. The finals for places 1-2 and 3-4 take place on Sunday Oct 13. The top three in FIH rankings are Korea (= 6), Japan (16) and China (18). HK men’s are ranked 42nd.